It always drives me a little crazy when I hear the Paleo/Low-Carb crowd constantly disparage whole grains as some kind of capitalist conspiracy to make us all fat. They mock the phrase “healthy, whole-grains” as some kind of deceptive health halo phrase coined by the food industry. But I think they’re honestly terrified of the stuff, and they’re actually speaking from conviction. Sure, inhaling hundreds of extra calories of white bread is usually a bad idea. But making bread the basis of your daily calories is a fine idea, and people have done it for centuries. Ancient Egyptians didn’t turn down bread, nor mock others for eating it, because they thought it made you fat. Maybe the Pharohs did, but they also probably knew laying around eating delicacies all day didn’t help either. If it’ll prove anything, I’ll try to eat a loaf of bread every day for the next month, during my 30 Day Bread Challenge. I’ll continue losing weight (I’m within 5-10kg of goal), because there’s nothing magical in bread that makes you fat. I know a lot of people are terrified of “carbs”, and there’s whole ketogenic communities out there dedicated to eating < 50g carbs/day. Those are the people that evolved to eat a few legumes or whole grains and store it all as fat that’s never released. We’ll see how many loaves I’ll eat over the next 30 days. 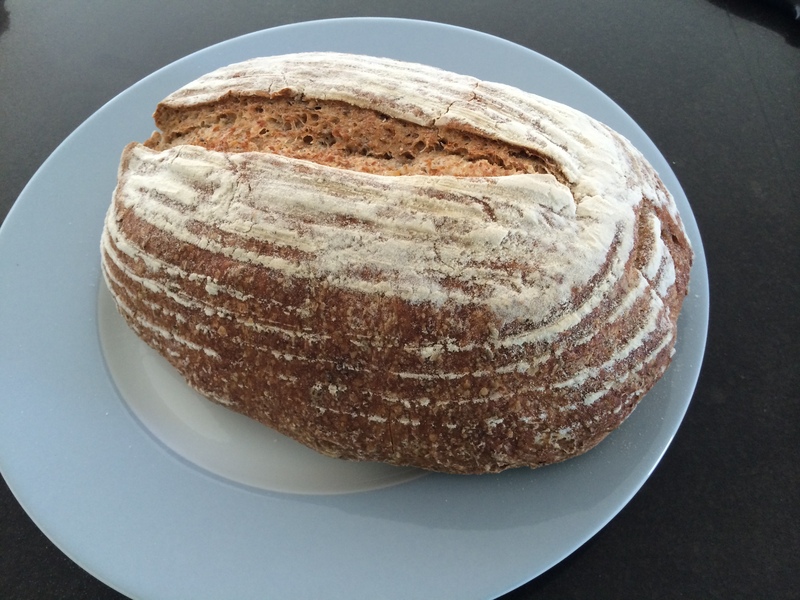 Today I picked up a 580g Rye loaf from Bread & Cie. I’ll probably have to ride there every morning, but at least the bread is warm and fresh. It’s not that far, but it’s uphill, and I burned almost 200 calories on this morning’s trip. Do you need to eat an entire loaf of bread each day? Maybe just part of it? I’m going to eat an entire loaf every day for 30 days. I need more calories than just a loaf of bread every day, so it’s not a problem. It’s just not very appetizing after a while.